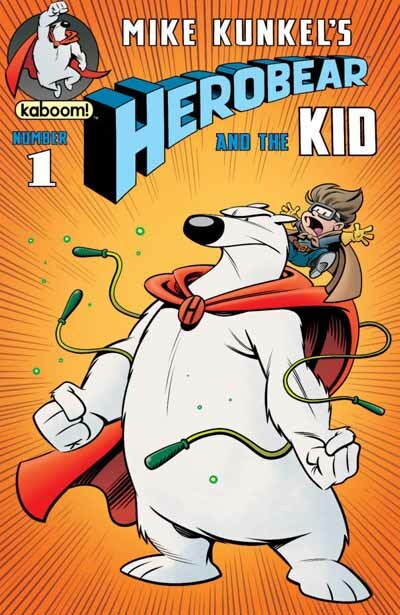 Speaking of Mike Kunkel (which we were recently), he returns with a new edition of Herobear and The Kid in the Herobear and the Kid 2016 Fall Special, out now from Boom! Studios. “Tyler and Herobear are able to stop the dinosaurs that are attacking the parade, but at what cost? With the help of Elmo (oh yeah, Elmo totally knows that Tyler and his stuffed animal are Herobear and the Kid! ), they soon discover that Von Klon has kidnapped Henry!” Trust us, it makes sense if you’ve read the previous installments. What, you haven’t? Go do that now! Then check out the preview pages over at Comic Book Resources. Below is the special variant cover by well-known comic creator Roger Langridge.